The Lofoten Islands are a wonderland of jagged mountains, beautiful fjords, and white sandy beaches. 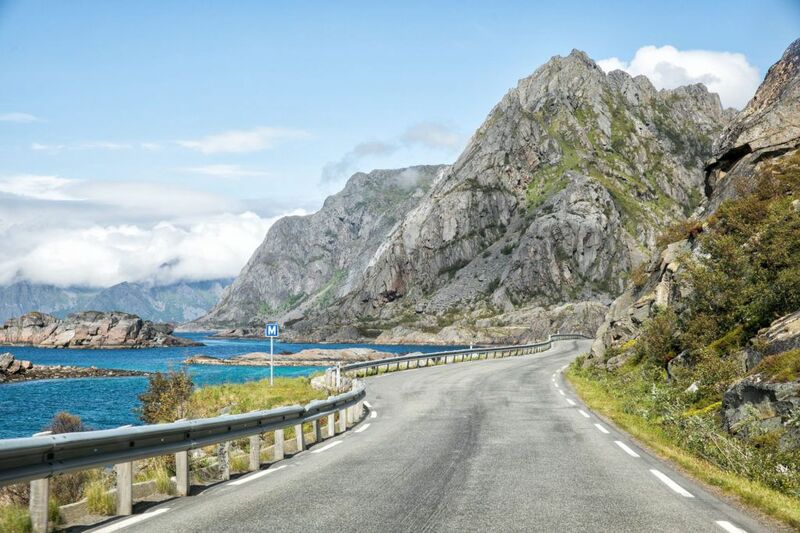 This is a spectacular part of Norway to explore, especially for those who love scenic drives, hiking, and being outdoors. 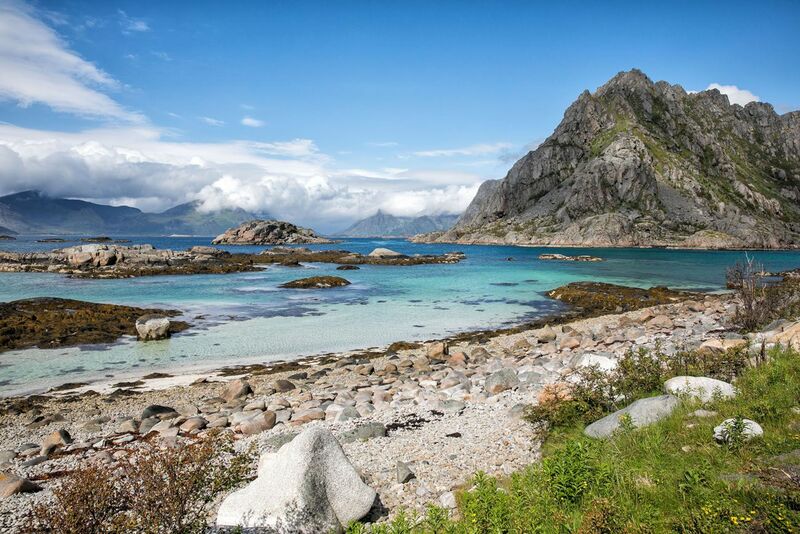 If you are planning a trip to Norway, here are 10 awesome things to do in the Lofoten Islands. 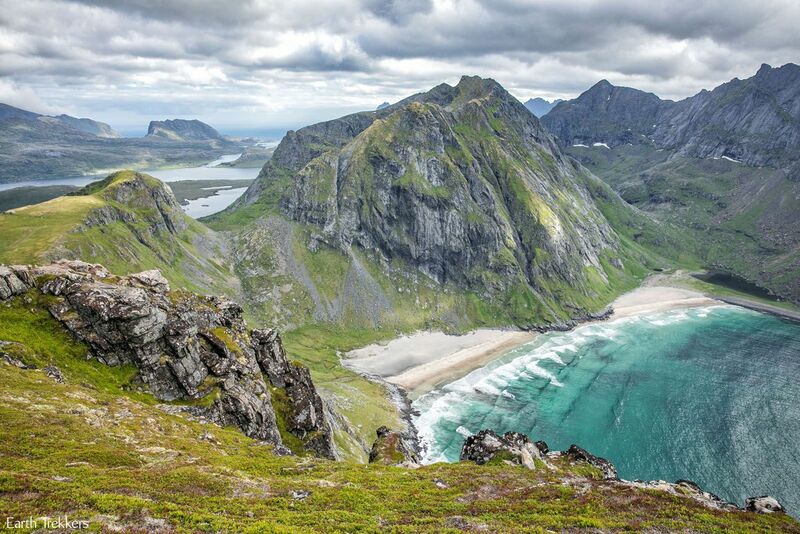 The Lofoten Islands are home to some of the most breathtaking landscapes in the world. 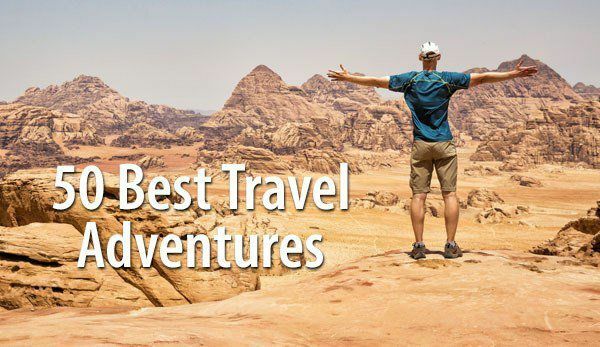 Whether it is from the road, from a hiking trail, or from the window of your hotel, you will be treated to some jaw-dropping views. Fredvang Bridges seen from the sky. Yeah, you heard me right. 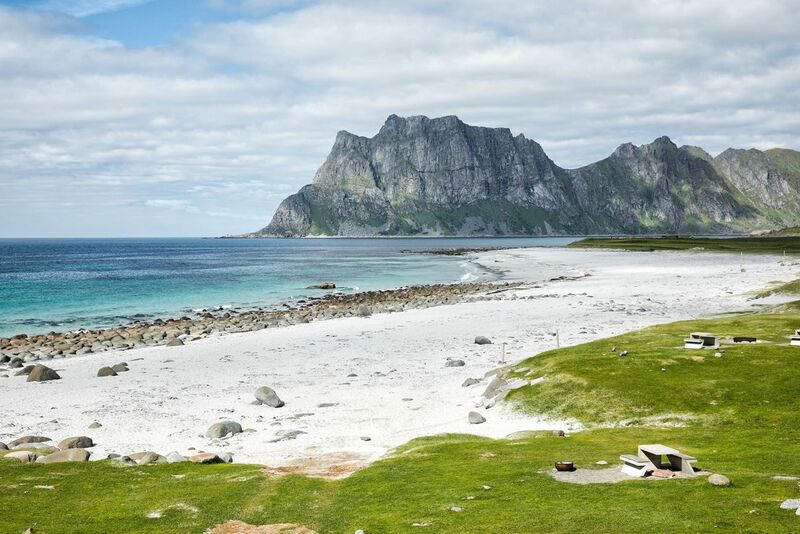 The Lofoten Islands are home to some of the most beautiful beaches in the world…long stretches of white sand and crystal clear aquamarine water, all with the backdrop of towering, jagged mountains. 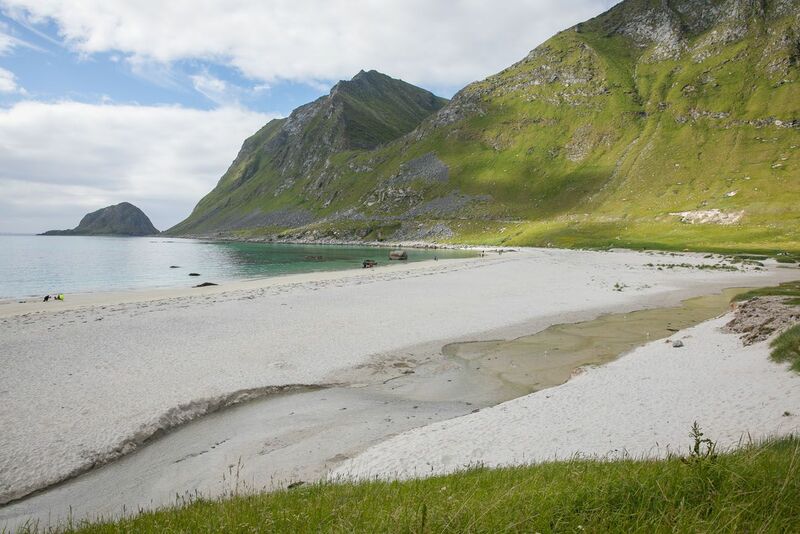 Ramberg Beach, Ytresand Beach, Uttakleiv Beach, and Haukland Beach are all easy to get to by car. The only way to get to Kvalvika Beach is on foot. 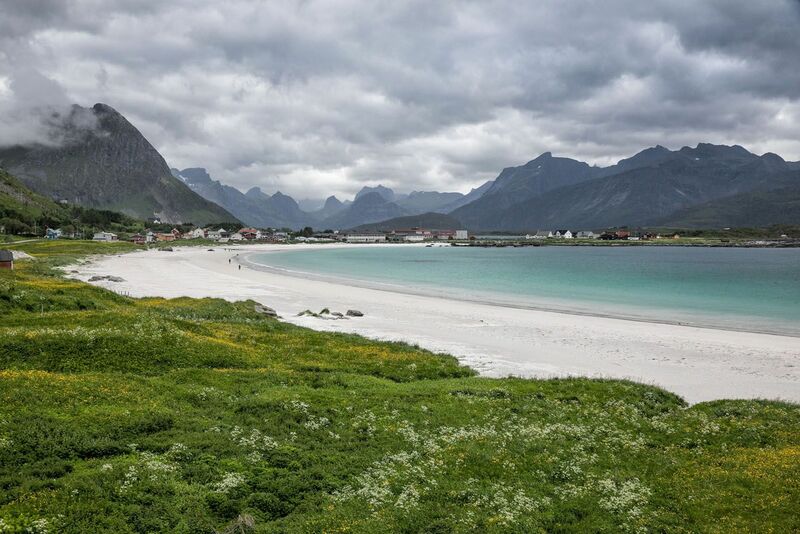 To get to Bunes or Horseid Beaches, you will need to take a ferry from Reine and then hike the rest of the way. 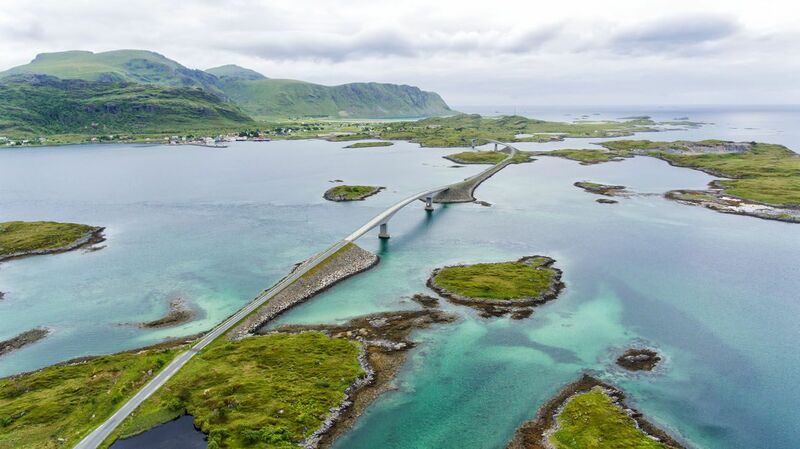 OK, so this may be the biggest surprise on this list but the Lofoten Islands are an up and coming surfing destination. Unstad Beach has world-class waves that attract surfers from all around the world. The water temperature ranges from 8 to 14°C (46 to 57°F) so you’ll have to wear a wetsuit. The surf is stronger during the winter months, best for those with lots of experience. If you are new to surfing and want to give it a try, the waves are smaller (and the water temperature is a bit higher) during the summer months. 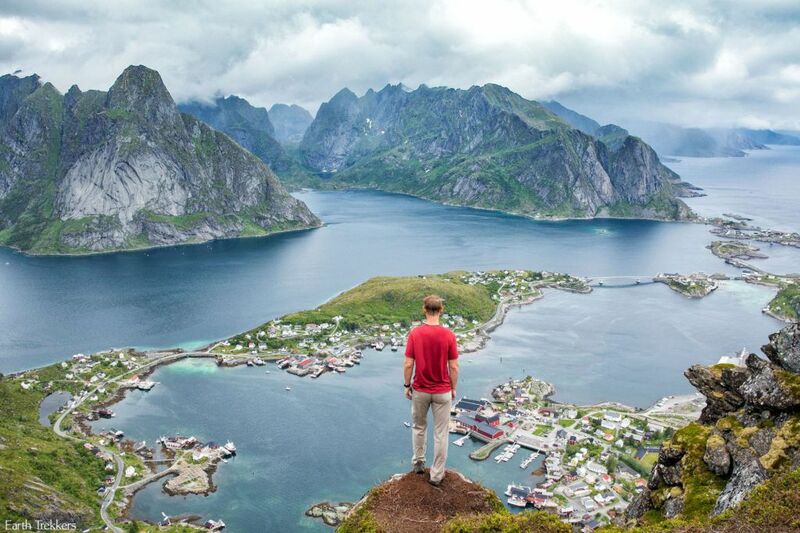 Without a doubt, this is our favorite thing to do in the Lofoten Islands. To see across the rocky mountain peaks from a hiking trail is an unforgettable experience. 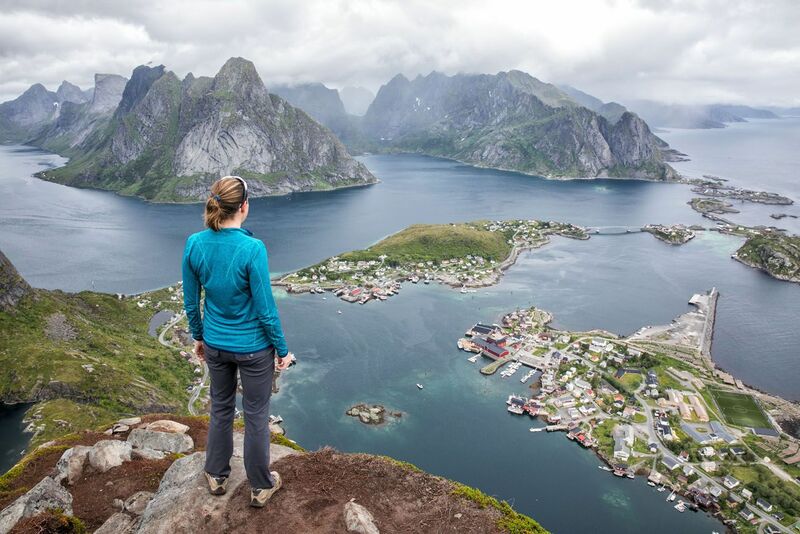 Many of the hikes in the Lofoten Islands involve climbing to the top of a mountain, so be prepared to work hard. 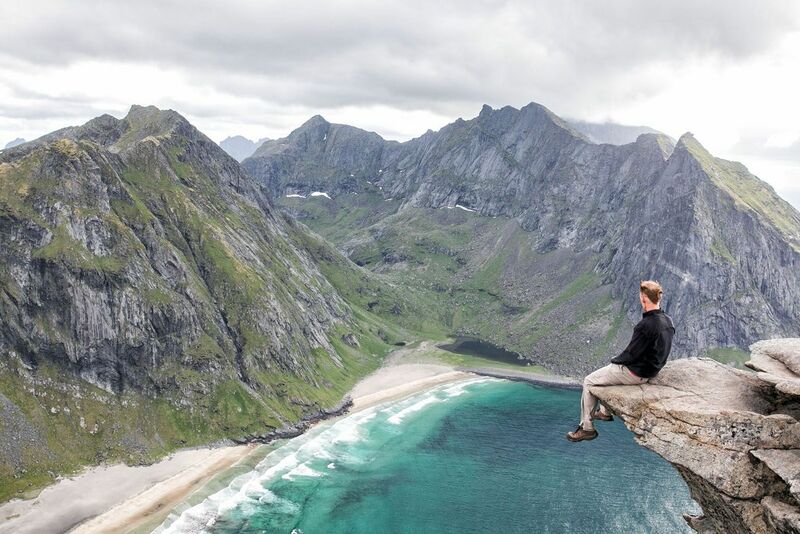 But it’s worth it…seeing the Lofoten Islands from the road is wonderful, but there’s nothing like standing on top of one (or more!) of these mountain peaks. During our four days on the Lofoten Islands, we hiked as much as we could, sometimes doing two hikes in one day. Unfortunately, a solid day of rain kept us indoors on our last day, so we didn’t get to everything on our list. Reinebringen is the most popular hike, but it’s a challenge and not to be underestimated. We loved Ryten, with its spectacular view over Kvalvika Beach and its slightly easier hiking trail. 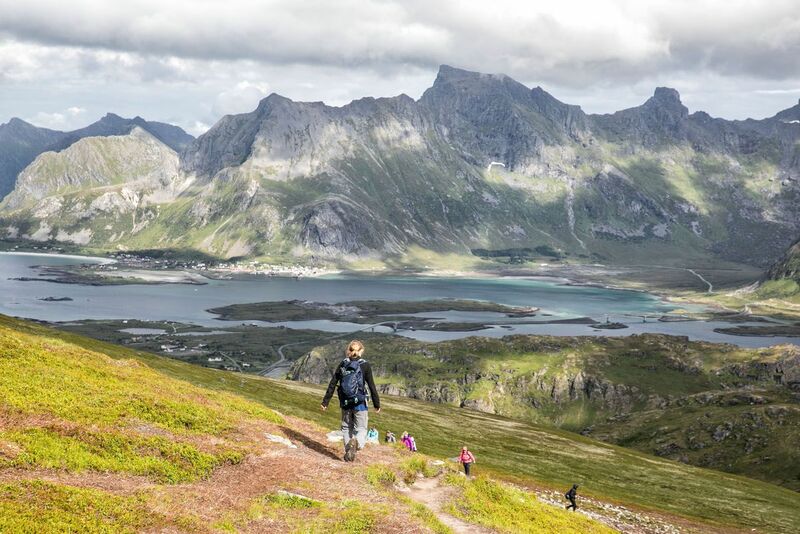 The hike up Svolvaer Fløya and Festvagtind are similar, short trails that offer sweeping views across small islands and towns. Another view from the Ryten hiking trail. A rorbu is a small fisherman’s cabin that has been renovated and turned into an apartment. They are unique to the Lofoten Islands. Supported on stilts, these small cabins are perched out over the water, offering unique views of the area. Many rorbu offer a small kitchen and living area with one or more bedrooms. 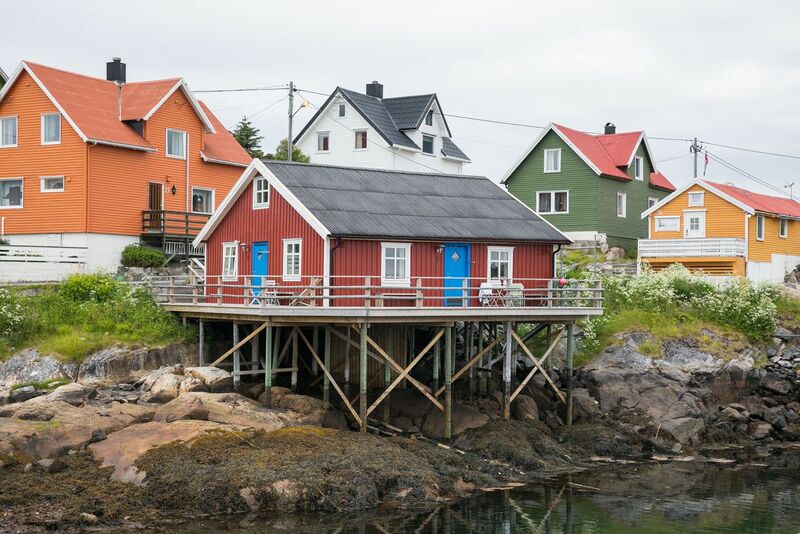 Explore the towns from Svolvaer to Å and everything in between. 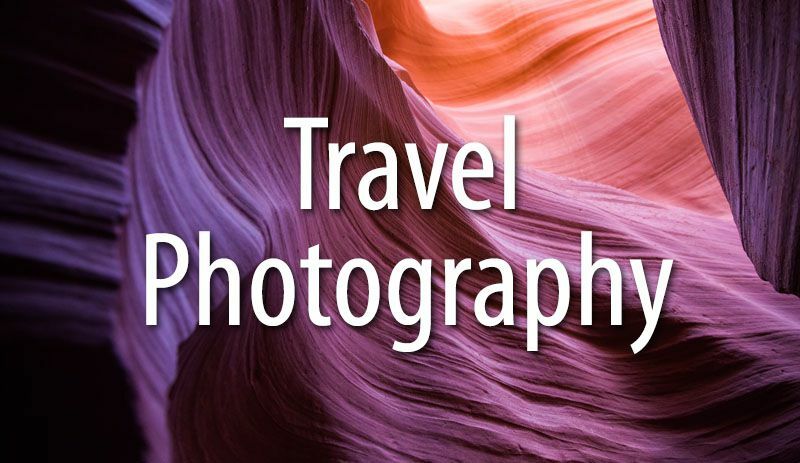 They are great places to wander, to shop, to photograph, and to have lunch or dinner. Svolvaer is one of the largest towns in the Lofoten Islands. 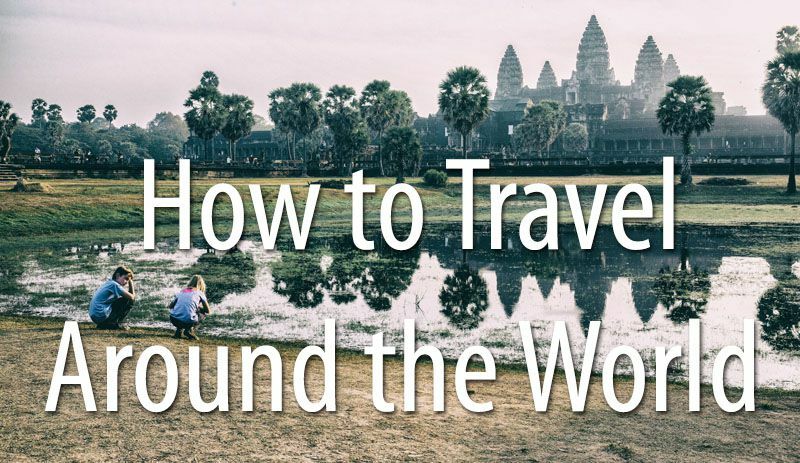 This town has an airport, a ferry port, a bunch of great hotels, and restaurants. 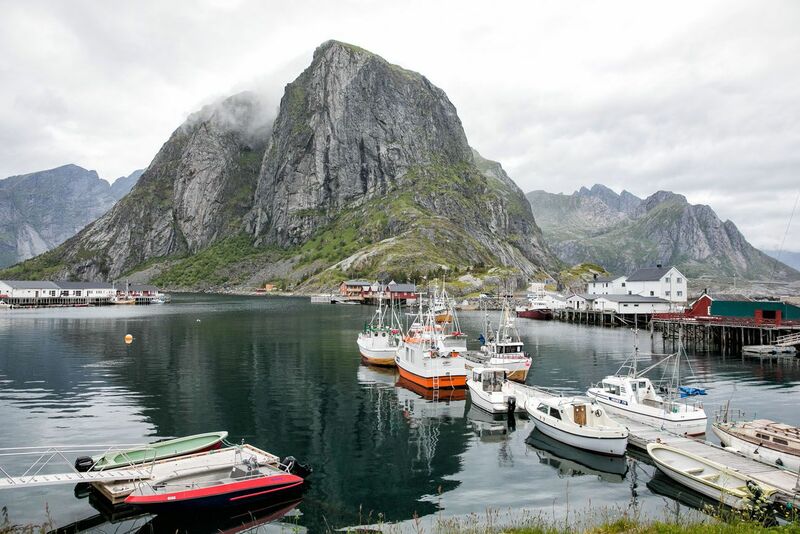 You can also visit the Lofoten War Museum, go on a fishing excursion, or take a cruise around the islands. The town of Svolvaer seen from Svolvaer Fløya. 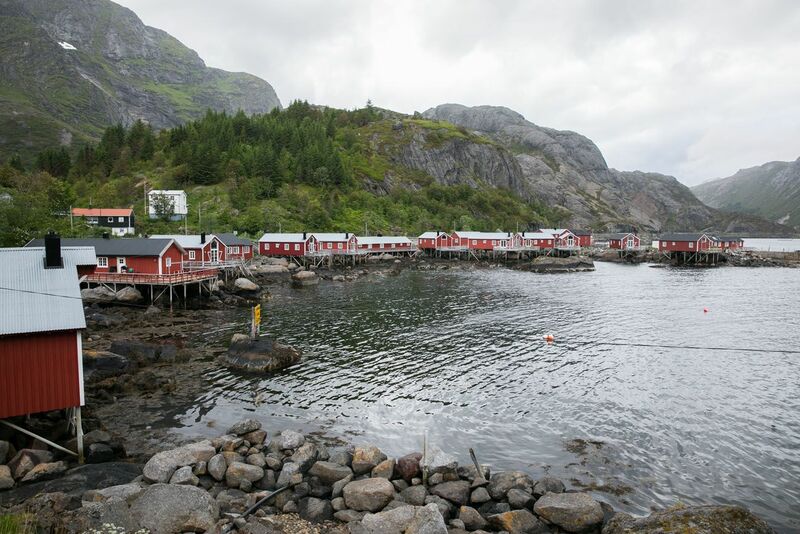 Henningsvaer is a small, picturesque fishing village that is scattered across several islands. This is a great road trip destination and with a handful of great restaurants, being here for lunch or dinner is perfect. We ate at Fiskekrogen but Lofotmat and Henningsvaer Lysstoperi & Café get great reviews, too. 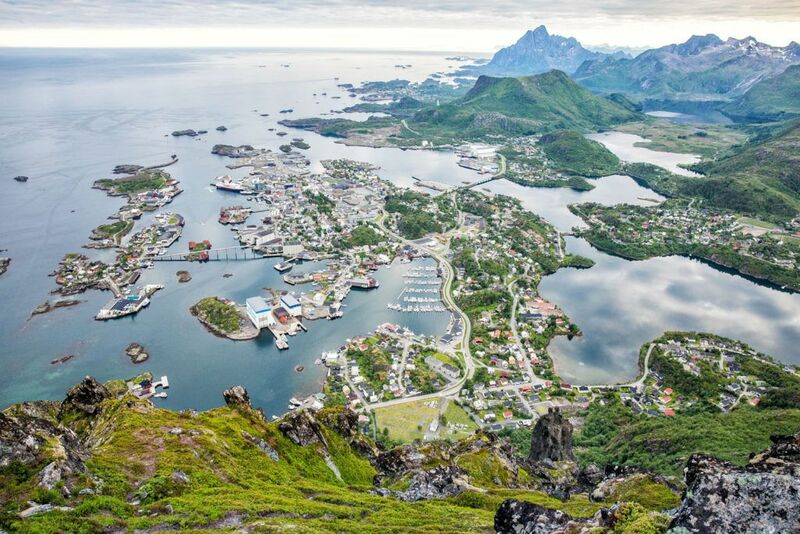 These are the quintessential towns in the Lofoten Islands. Scattered across several small islands, these towns are very close to one another so they feel like one large town. Fishing is big here, so you will see a lot of fishing boats, fish heads drying on racks, and noisy seagulls in the skies. 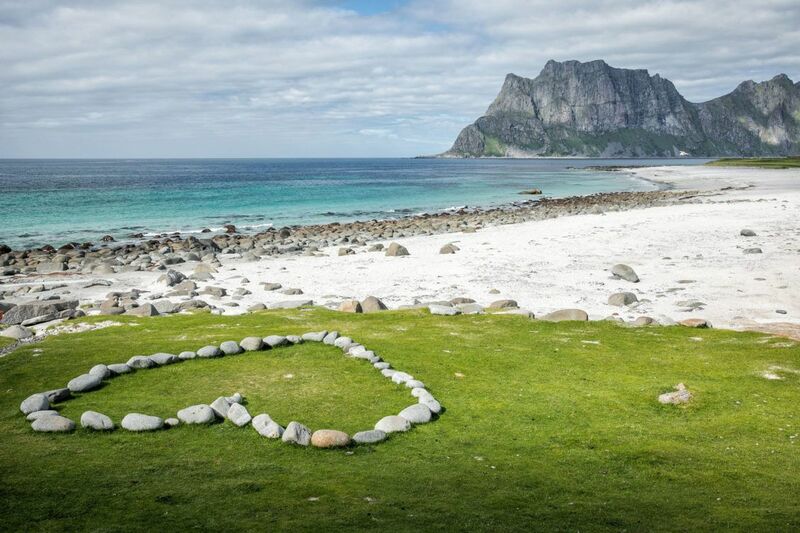 This is iconic Lofoten Islands and it’s not to be missed. 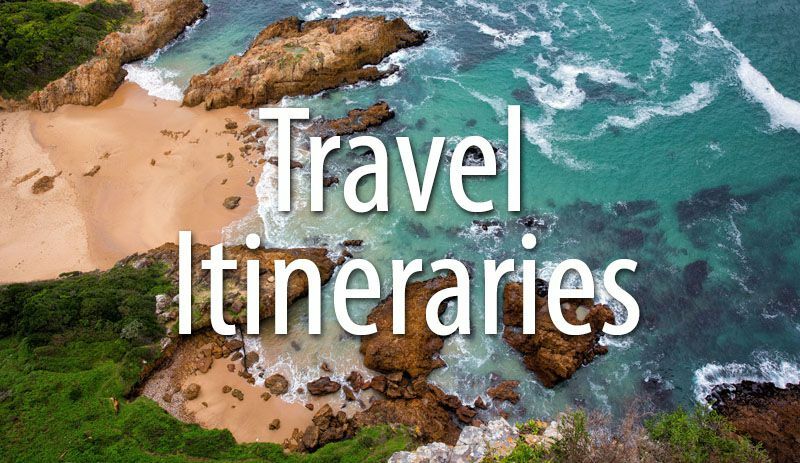 With a bunch of rorbuers to pick from, this area is also the perfect place to stay. 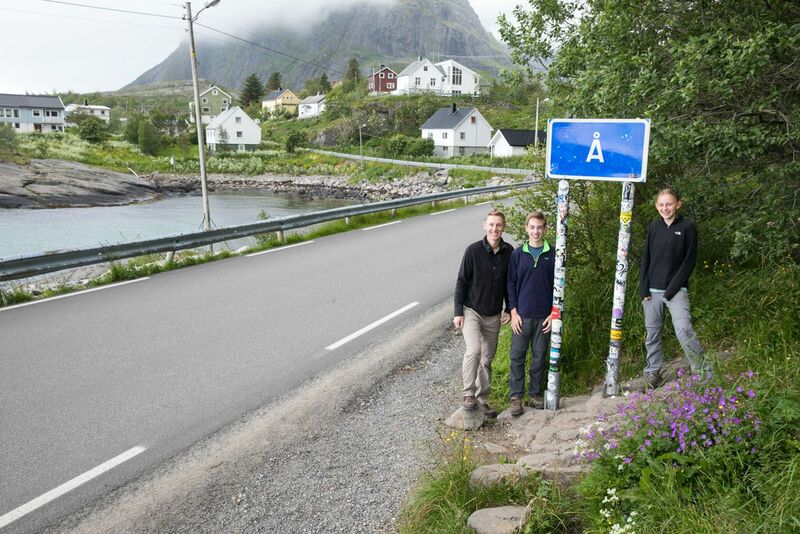 The tiny town of Å (pronounced aw) is the southernmost point of the Lofoten Islands, at least what is accessible by car. 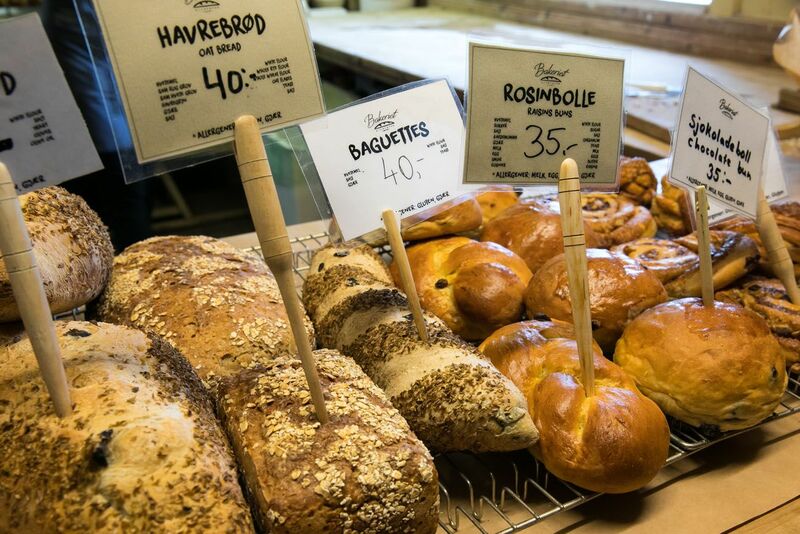 While you are here, visit the tiny, rustic bakery, the Lofoten Stockfish Museum, or the Norwegian Fishing Village Museum. 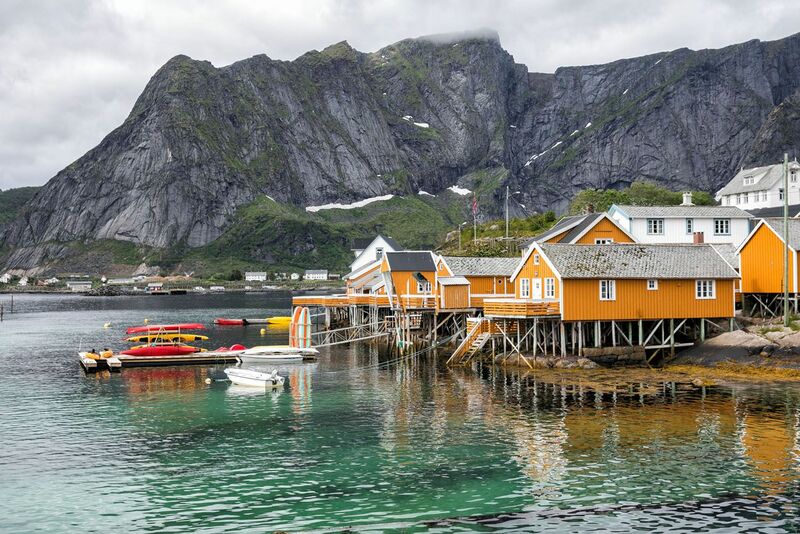 Nusfjord is one of the best preserved fishing villages in the Lofoten Islands. Now, it’s an open-air museum where you can tour a sawmill, an old-fashioned store, and a factory that makes cod-liver oil. You can also stay overnight in one of the old fisherman’s cabins (rorbu). 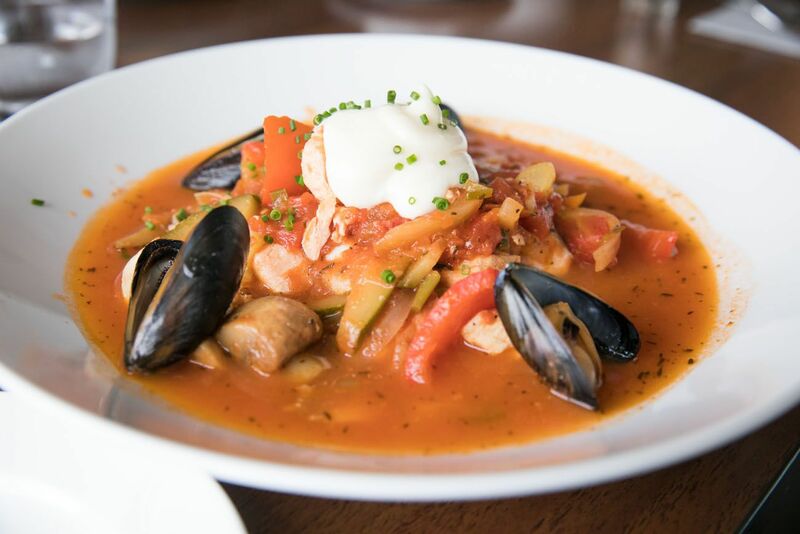 With its thriving fishing culture, you’ll no doubt come across fish and seafood on the menus of nearly every restaurant in the Lofoten Islands. In Henningsvaer, we ate at Fiskekrogen, a very highly rated seafood restaurant in the Lofoten Islands. 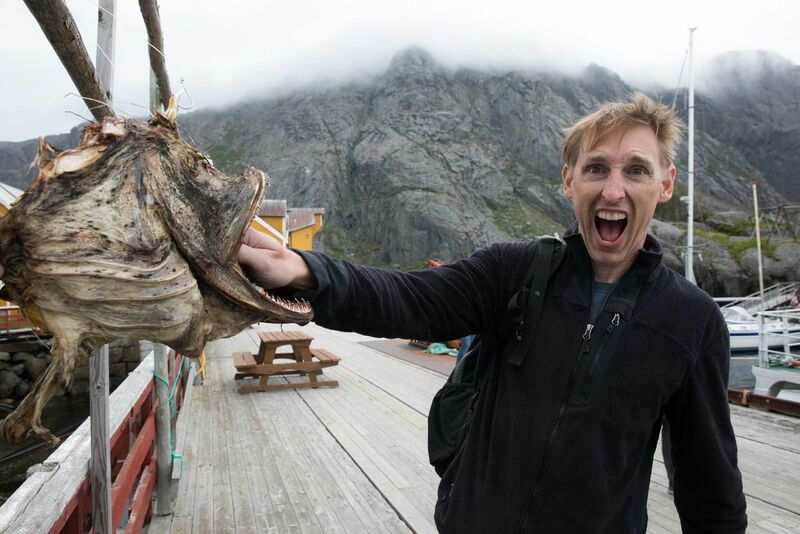 In Reine, Krambua and Gammelbua are both very good restaurants offering fish, seafood, and steak. If you are on a budget, go to Anita’s Sjomat. This was our favorite restaurant in the Lofoten Islands and the prices were very reasonable. In Sørvågen, there is a great restaurant called Maren Anna that we never made it to (but wished we had). Pro Travel Tip: Eating out is very expensive in Norway. Adding in wine, beer, or cocktails will make your bill even more expensive. If you choose to dine out every night, this will be one of your largest expenses in the Lofoten Islands. We balanced things out by buying breakfast and lunch at the grocery stores. 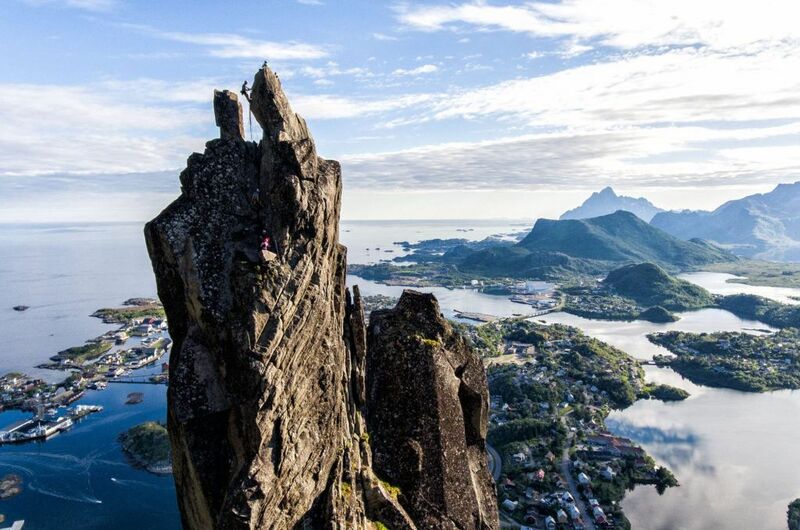 Svolvaergeita, also called The Goat, is a pinnacle of rock that is very popular with rock climbers. 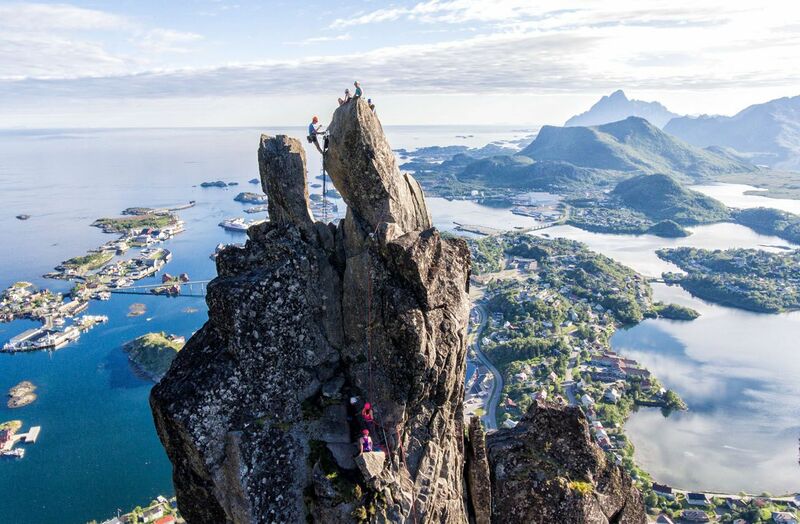 Those with a good sense of adventure can rock climb to the top of Svolvaergeita and those who are just a little bit crazy can jump from one horn to the other. And yes, you can do this if you are a beginner. The Lofoten Islands are located in the Arctic Circle. From September to April, it’s possible to see the Northern Lights, just keep your fingers crossed for clear skies. 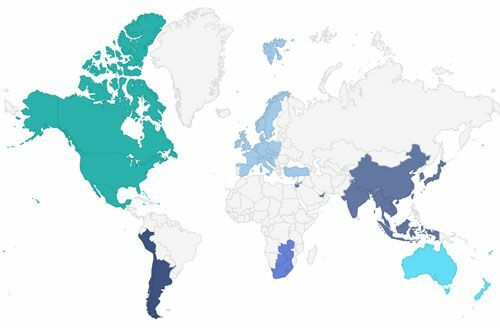 How to Use This Map: Click the tab in the top left hand corner of the map to view the layers (best things to do and restaurant recommendations). You can click the check marks to hide or show layers. If you click the icons on the map, you can get more information about each point of interest. 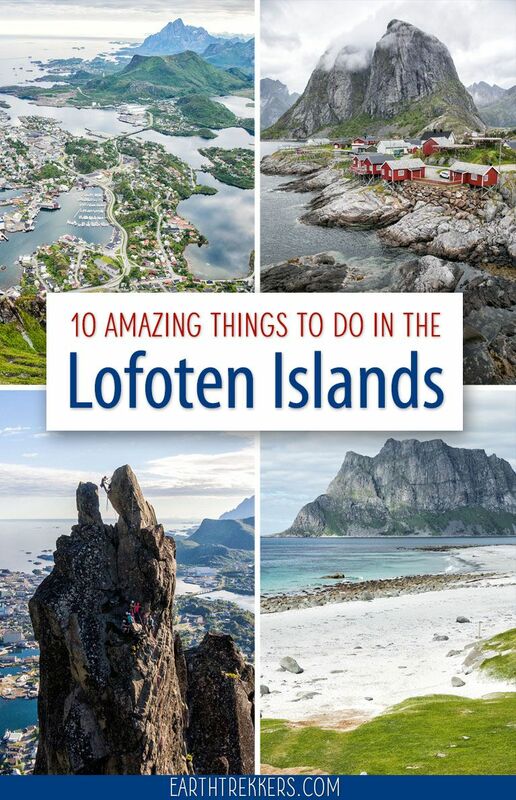 Are you planning a trip to the Lofoten Islands? 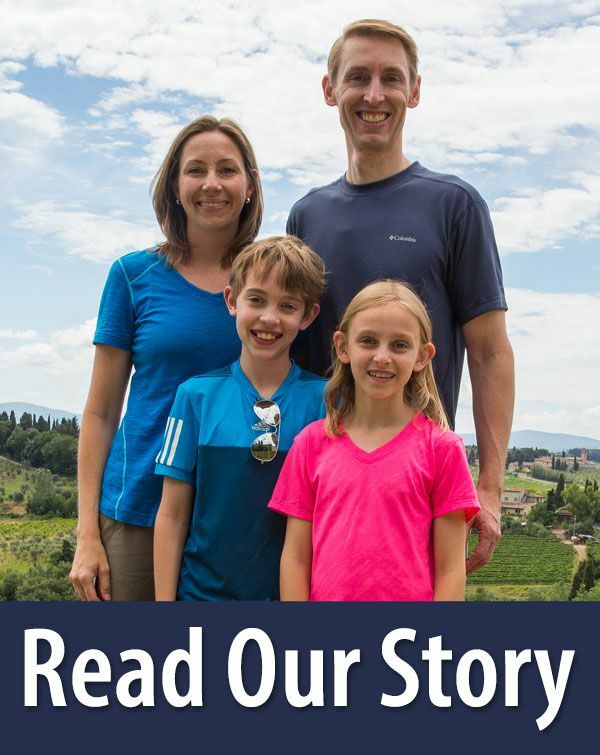 If you have any questions let us know in the comment section below! Wow.. Just amazing article with lot of detail about the place. Love you guys travel journey. 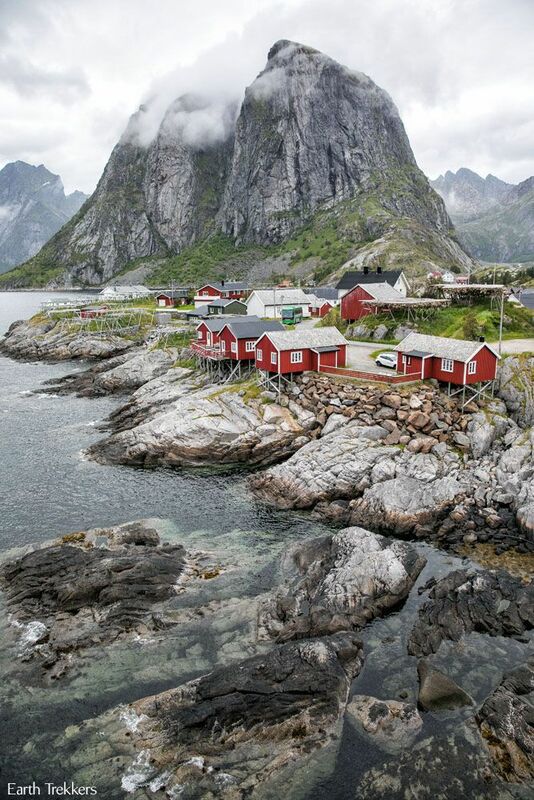 Definitely will visit Lofoten islands one day. 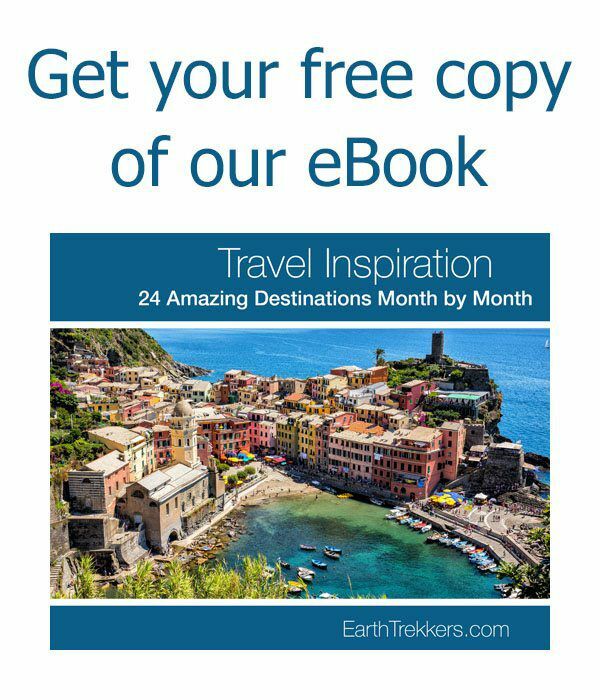 I was just wandering if its possible can u put up a itinerary for the Lofoten island similar to the Norway itinerary u guys did if possible…Thanks.